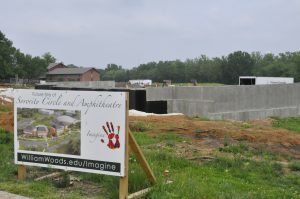 On any given day, more than a dozen workers are moving dirt, pouring concrete and focusing on the myriad of projects involved with building Sorority Circle on the campus of William Woods University. 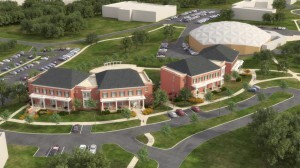 The Circle will contain two residence halls, each housing two sororities. A fine arts amphitheatre will also be a part of the project. Sorority Circle is the largest project to be funded through donations to the Imagine Campaign. Alumni, employees, donors and friends, contributed to make the $10.8 million Imagine Campaign a success, raising $600,000 over goal. The final figure includes a $1 million grant from the J.E. and L.E. Mabee Foundation. To qualify for the grant, WWU had to raise more than $900,000 from private funds during the last 12 months of the campaign. “The Mabee Foundation invests in us because they believe in us … in what we are doing every day to provide lifelong learning opportunities for our students,” Dr. Jahnae H. Barnett, WWU president, said. The Imagine Campaign comprised three objectives— the construction of Sorority Circle, an endowment to support the Center for Ethics and Global Studies and the renovation of the Tom and Claudine O’Connor Alumni and Visitors Center. “Our faculty and staff so strongly believe in these objectives that 91 percent contributed to the campaign,” Barnett said. Sorority Circle will not only provide substantial additional housing to the entire campus—benefiting both Greek and independent students—but it will also provide much-needed technological and structural improvements, such as wireless Internet access and central air-conditioning. According to Mike Dillon, director of the WWU physical plant, construction is right on schedule. “Much of the concrete work on Building ‘A’ has been completed. In the last week of June, we’ll be putting up the walls on Building ‘A’ and that’s when the building will really begin to take shape,” he said. Sororities celebrate start of Sorority Circle. According to Barnett, by housing all four sororities together in one village, the residential complex will help to strengthen the university’s Greek community. The individuality of each sorority will be maintained through separate entries and individual common areas for studying, socializing and conducting meetings. The complex will provide 136 beds. In addition to meeting housing demands, the complex will also provide a comfortable, safe and modern living environment for WWU students. At the start of the campaign, William Woods received a lead gift of $2.5 million from the Brockman Lambert Foundation, representing the largest foundation gift ever received by the university. In addition, an anonymous individual donor provided a leadership gift of $2 million. More recently, former WWU board member and Central Trust Bank Board Chairman Sam Cook made a significant donation in support of the university’s Imagine Campaign, and the amphitheater to be built behind Sorority Circle will bear his name. “The Imagine Campaign has built upon the William Woods mission to distinguish itself as a student-centered institution and fulfill its vision to be recognized as a progressive and growing leader in higher education,” Barnett said.